Travel is designed to fuel discovery, as well as promote a sense of wonder, excitement and curiosity. While the tourism industry can do its best to ensure a trip goes seamlessly, no one is immune from unforeseen disruptions such as political standoff or natural disasters. 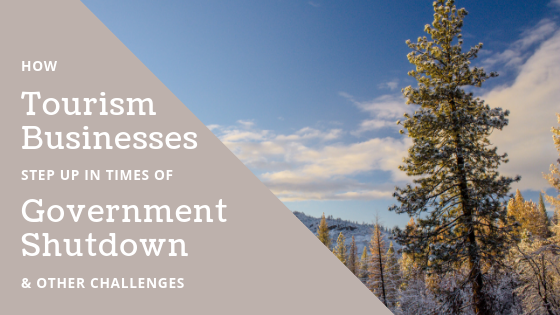 Let’s look at three examples – present and past – where tourism businesses affected by these types of challenges have risen to the occasion. While access to national parks may remain open during the current government shutdown, the absence of government funding for the park services department – whose duties range from clearing the snow trails to ongoing receptacle removal – can quickly pose a negative impact upon visitors. Rather than succumbing to the situation, tour operators and hoteliers at locations such as Yellowstone National Park have stepped up to volunteer their own time and resources to keep the destination safe and attractive for tourists. Winter isn’t an off-season for the park, with NPR reporting that between 20,000 to 30,000 people a month still come in wintertime, and the snow is a big attraction. According to Montana Public Radio, Xanterra, which operates the only hotels open inside the park during winter, organized 13 companies that run winter tours in the park to collectively fund nearly $7,500 daily to keep more than 300 miles of snow-covered roads (the only access to Old Faithful and other attractions) groomed. Xanterra is picking up a little over half the tab to keep park roads open, and its employees helped clean public bathrooms at Madison Junction, Canyon Village and Old Faithful. Additionally, snowmobile and snow coach guides taking tourists in to the park’s interior packed in toilet paper and packed out trash. “There’s a sense of community and empowerment that comes with personally offering your time and talents to be able to maintain and care for a land that you enjoy visiting time after time,” said Jason Murray, owner of Southwest Adventure Tours. An operator currently running tours in five Utah national parks, plus the Grand Canyon and Yellowstone, he adds that the local initiative also shows the care, compassion and appreciation for the visitors who come there. Murray explains that it’s essential to stay abreast of the latest park information in order to provide the most accurate information to his customers who have already booked trips in the area, and others who now express uncertainty in confirming future excursions. As a member of Travel Alliance Partners (TAP), he looks to his established partnerships with DMOs, such as the Moab Area Travel Council/Visit Utah and The Iron County Office of Tourism, which provide him with detailed updates on the parks’ status on a weekly basis. How can you give back now to national parks to help make a difference? If you are not working with a DMO in an affected area, donate to the National Park Foundation’s Parks Restoration Fund to support the parks that need the most help. Erin Francis-Cummings, President and CEO of Destination Analysts described how challenging times can lead to creativity and resourcefulness on episode 89 of Destination on the Left. She explained while working at the San Francisco Travel Association how everything came crashing down after 9/11, particularly in San Francisco with the added dot-com crash. “I learned how to work with a very lean budget and be absolutely progressive in thinking about how to accomplish our goals, and also how to take risks,” she said. Addressing Safety Concerns for Traveling into the U.S.
Francis-Cummings’ current role at Destination Analysts has also faced challenging times. The State of the International Traveler, their annual study that surveys 800 international travelers in 14 key global feeder markets to the U.S., helps the industry look at perceptions and sentiment about the U.S and the country as a travel brand. One of the questions posed to over 11,000 people in 2018 asked, “Why are you not coming to the United States?” Disagreement with U.S. national politics was the main response for international travelers in Europe, while in Asia, she was surprised to learn the main concern was personal safety. Disaster relief is yet another example of how the industry may come together in the face of adversity. As President & CEO of Tourism Cares, Mike Rea helps to unite the industry around critical philanthropic needs and opportunities that are best tackled together. Rea also expanded on the travel industry’s care, stewardship and sustainability to the places, cultures and people they love personally and professionally. Through Tourism Cares, he’s been working to make giving and volunteering even more effective and satisfying for travelers, professionals and companies. One such example is The Good Travels Advisor program, which Rea explains allows travel agents to not only provide a gateway to products, but also cross into the meaning space. The program offers basic tips on giving, volunteering and social experiences of clients and how travel agents engage them. Rea goes on to note that they now have a growing community of travel agents with a base level of knowledge in social and philanthropic travel, and there is more to come.